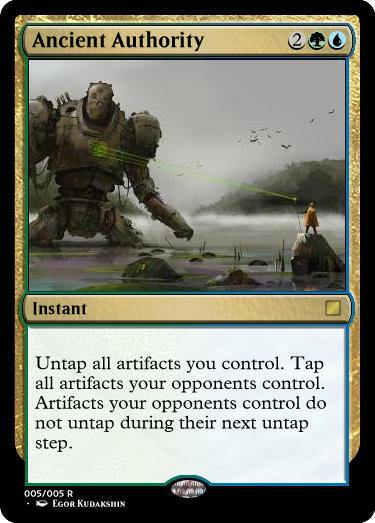 • Return target artifact from your graveyard to your hand. • Return target enchantment from your graveyard to your hand. Going to close this challenge in around 27 hours. I think everything is costed correctly? Although, it could probably enter untapped, unless the intent was to make summoning sickness less confusing. I’m uncertain about the wizard rider as well- casting and then animating an artifact is not something I’d picture in wizard tribal. Maybe gaining a bonus if you control a wizard instead? 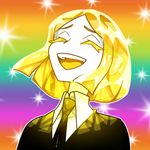 Or even a creature of a certain color? Can someone link me to a forum with a guide on how to share the card images so large? I can't figure it out. I searched and brainstormed for a while about whether this was a green effect or not. My conclusion: no. The “artifact reanimation” effect is most common in white and blue, with white also having a number of cards that recur artifacts to hand (red also has Trash for Treasure and black barely squeaks in on Sharuum). Green… doesn’t have either. If Revitalise said “permanent” (and thus cost more) it would be in an arguable state rather than a pie break. Disclaimer: I have never plaeyed planechase. Looking at existing phenomeons (phenomena? ), they seem to be balanced such that they don’t favor a particular deck (well, other than the boardwipe helping fewer-creature decks). 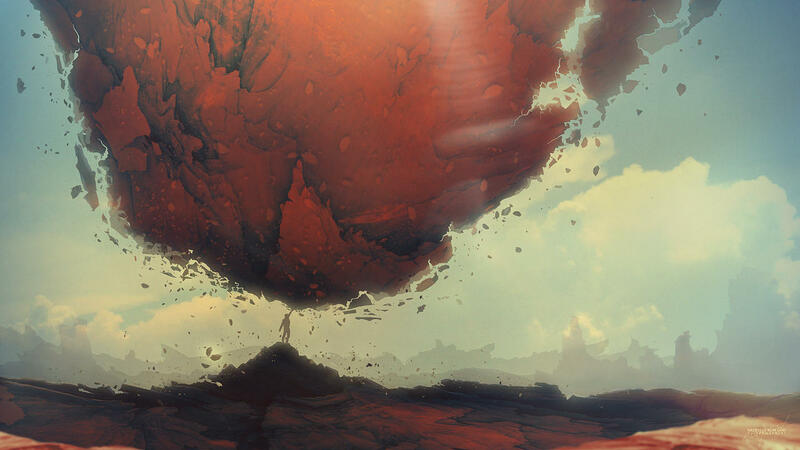 In 60-card casual multiplayer, it’s possible for a deck to play no artifacts and get no benefit, and while planechase commander may have more artifacts, it also has a higher potential for artifact-centric decks. At the same time, planechase is a house format so whoever sets up the planar deck can choose whether it should be included. I do like the overall idea of the card, since being a creature can be an upside and a downside. It is kind of awkward how it makes potentially larger creatures 4/4, though. 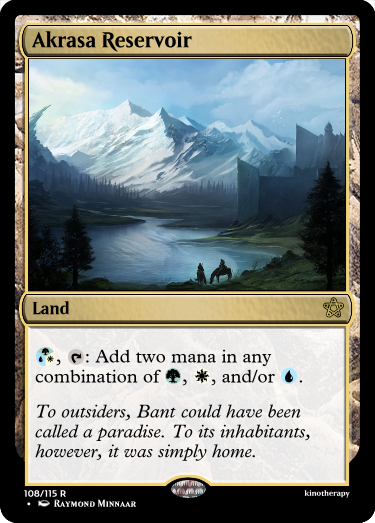 I believe this is undercosted- the closest approximation is Leafdrake Roost, which requires a “3” mana investment for every token, is in two colors, and doesn’t have the benefits inherent in a fortification. 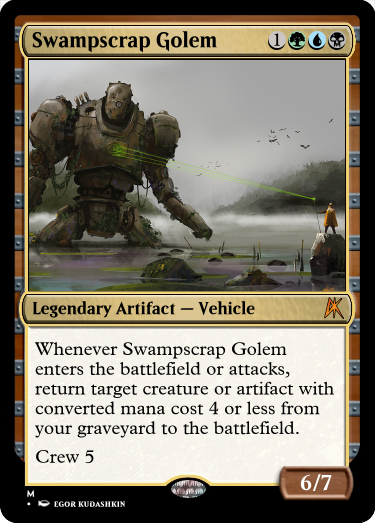 Other effects such as Spawning Grounds and Sandwurm Convergence are eight mana but are less similar to the Titan. I’m also not convinced that it needs hexproof from green, as even if the land is destroyed (unlikely) the Fortification can be refortified (which is apparently a real word). 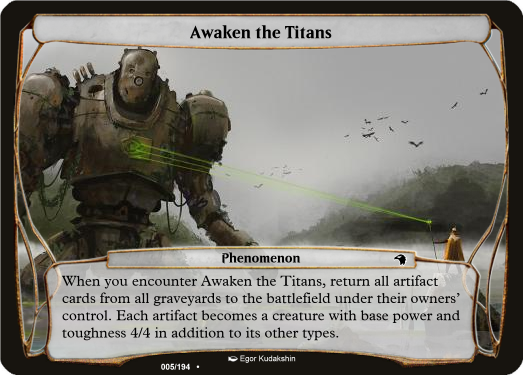 I like the overall theme of a deadly mechanism re-arising, but I’m not sure the flavor connects since multiple titans can be made by different lands. Is it one titan churning out little ones? More often than not, the tapping and freezing effects will be the most useful. However, I do like that you can use it with mana rocks to get some value back. Personally, I would like to see it as a 3-mana sorcery since as-is you can cast it upkeep and deny them over for another turn, but since they have the opportunity to respond I’m probably overthinking it. In a similar vein, it has the potential to be monoblue. Dang it viriss ! I wanted to do...well, a plane, but...dang it! Target artifact becomes a 3/3 artifact creature until end of turn. It gains haste. Artifact animation is… arguably a green effect, but certainly not a white one. This could also easily be an instant compared to Ensoul Artifact, which creates a bigger, permanent dude. I like the overall versatility on this. It can be a 4 mana reanimation spell and also a persistently value-generating beater, but the cmc requirement limits the usefulness of both. 6/7 is a pretty big statline, but crew 5 is a very significant requirement (which also serves to limit the value generated on the field). My main complaint is that it doesn’t feel green- heck, if you told me it was three colors I would guess esper. If I had to pick two colors for this card, I would go with white and blue. The times black and green have gotten artifact/enchantment recursion that type was a focus of the set. I could see this as “up to two target permanent cards with different types” potentially at 3 mana. The art doesn’t feel super red, but this feels like a nice “fixed” version of Ball Lightning/Spark Elemental variants. Since it can eat attacking creatures, it’s no longer a dead card when the opponent has a large board presence, plus as an instant it synergizes well with… cards that synergize with instant/sorceries. 5 power for 3 mana seems to be the correct rate as well. Thanks a bunch for the feedback and the win! (my first) I'll post the new picture shortly! Brofist from God by Kuldar Leement on Deviant Art. Target creature gets +7/+7 and gains trample and haste until end of turn. Then that creature fights target creature you don't control. Put target land that entered the battlefield this turn on top of its owner's library. Whenever a land enters the battlefield under enchanted player's control, that player sacrifices it unless they pay . "The weight of the world is not easy to bear." I like what you guys have done so far with this! Let me know when you think I should judge. Most contests give it a week, but you as judge of course have the final say! Judging in the next 24 hours sometime. Get em in boys and girls! 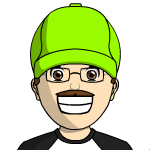 shiftyhomunculus can I get a render from you sometime today? if not, no pressure. Edit: I made up a frame for it just for reference so no worries. To everyone: I'll be judging these after work tonight and I appreciate your patience. This will be my first time judging and I'm fairly new to the community so I have some amount of anxiety about giving misleading feedback/critique, etc. Please bear with me! Thanks! Simple but elegant mechanic. I enjoy the brief flavor and feel like it adds to the overall quality of the card. Uncommon and instant seem fine. My only critical feedback is that I think it might be better at 1R. Enchanted creature gets +1/+1 for each land you control and is indestructible. Really like this cards mechanic. Colors seem good. Mythic rare seems right. I feel like it might be a tad on the cheap end of the cost/power spectrum. The Napoleon Hill quote is a nice touch. Atlas flavor feel is nice. 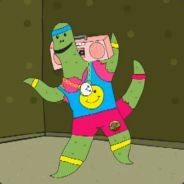 At least he is indestructible and might not need to shrug! 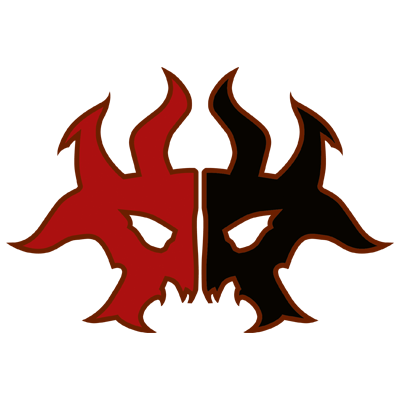 Put X 1/1 Red Elemental tokens into play under your control. I like the flavor of Meteors raining down elementals. "Create X 1/1 red Elemental creature tokens." No real issues with the cost, but overall I am not sure I'd play it without a combo for the ETB's... Purphorus or the like. I would definitely mess around with this card. Not sure how competitive it is in constructed, but that is a BEAST in limited. Maybe figure out how to make it cheaper? sacrifice something? dunno. 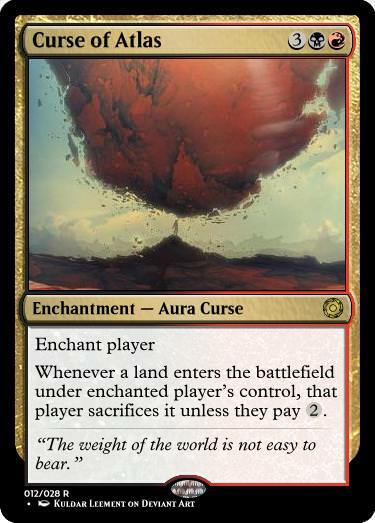 Whenever a land enters the battlefield under enchanted player's control, that player sacrifices it unless they pay 2. I love almost everything about this card. The atlas flavor is strong, the mechanic is cool. The cost works. I feel like if I were to change this card, I'd make the player have to sac unless they pay 2 life. Well done though overall. Target creature gets -1/-1 for each land its controller controls. 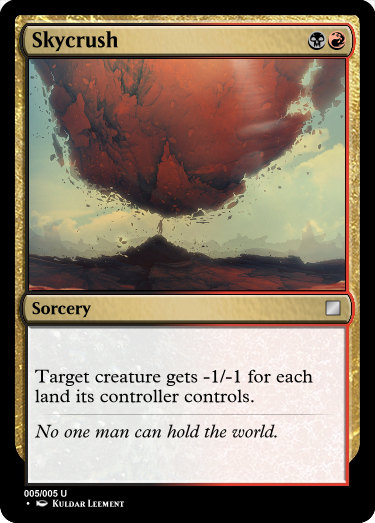 "No one man can hold the world." Simple, to the point. Interesting use of cheap BR. I'd have no probs playing this card in the right deck. 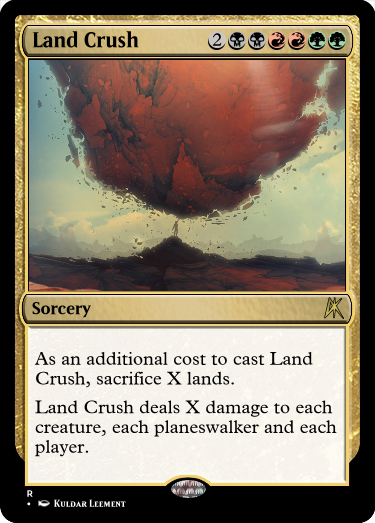 As an additional cost to cast Land Crush, sacrifice X lands. Land Crush deals X damage to each creature, each planeswalker and each player. It is an interesting card. In the right situation it could be a wincon but I hesitate to love it because I feel like most of the time its going to hurt me more than its worth. Maybe work on the casting cost and/or have it not target you or your stuff? 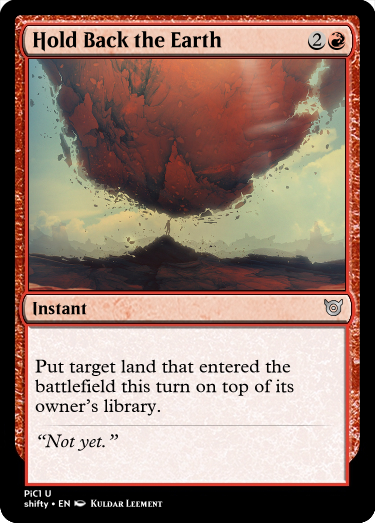 The owner of target artifact or land shuffles it into their library, then reveals the top card of their library. If it's a permanent card, they put it onto the battlefield. I have had a hard time deciding how I feel about this card. In some scenarios it seems really useful, but in others, it seems like you would go from the frying pan to the fire. That said. for the cost and the rarity, I think its pretty balanced and the flavor gives insight into the justification for the cards quirkiness. Gamma3! Great work! Thanks to everyone for contributing! Good luck folks! I cant wait to see what everyone comes up with! 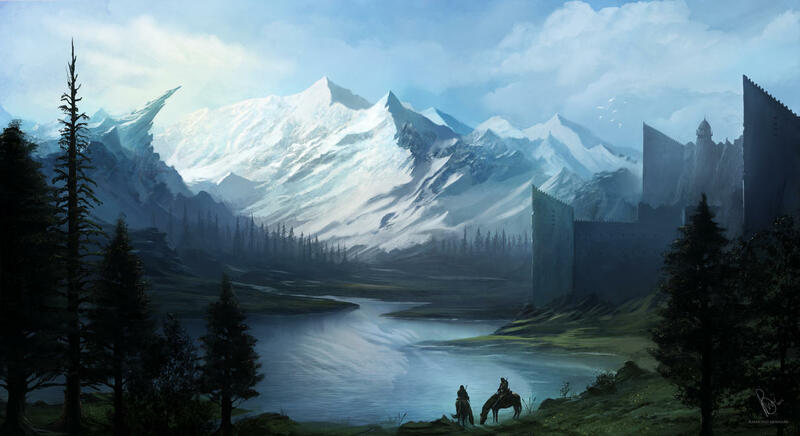 When Darkriver Valley enters the battlefield, choose Castle, Mountain or Forest. • Castle — , : Target creature gains -1/-0 until end of turn. • Mountain — , : Scry 1. • Forest — , : You gain 1 life. Maybe it should be ? Add , , or . , : Target creature gets +0/+4 until end of turn. "Under Arcades's watchful eye, there was order." When ~ enters the battlefield, look at the top three cards of your library. You may reveal a creature or land card from among them and put it into your hand. Put the rest on the bottom of your library in any order. 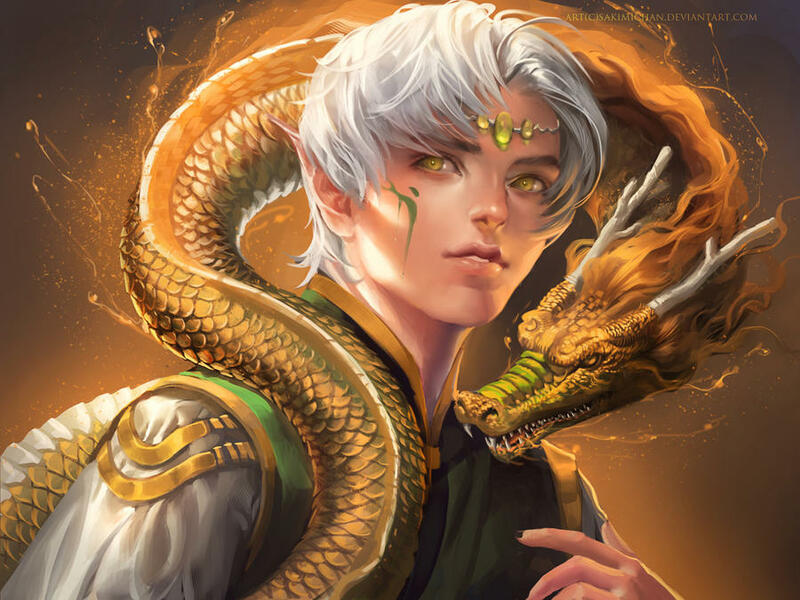 The first step to becoming a ranger of Corovia is recognizing that nature is deadlier than you can ever hope to be. Heart of the Valley enters the battlefield tapped. [T]: Add , [G], or [W]. Whenever you play an Island, you may draw a card. If you do, discard a card. Whenever you play a Forest, you may give target creature +2/+2 until end of turn. Whenever you play a Plains, you may gain 4 life.